By far my favorite time of the year. I wish the house could be filled with Christmas lights all year-long. This year we ventured out of our comfort zone and bought a flocked tree. No question my husband was definitely skeptical of my choice. Thank goodness he trusts me and allowed me to run with it. It’s now our favorite tree to date. 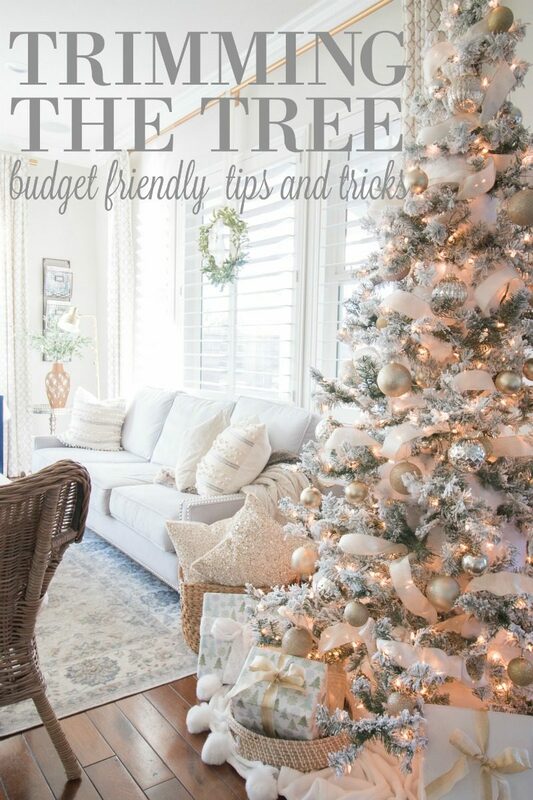 I shared a bit of this on Instagram and had so many questions about how it was decorated so I thought I would share my budget friendly tips and tricks on how to trim a tree. Let me be very clear. I am no pro and there gorgeous trees out in blogland that belong in magazines. I just have learned some things as the years have passed and wanted to share. We typically don’t load up our trees but take the more simple route. That also keeps the cost down. Not to mention it’s much faster to put up and take down. By all means, be sure you narrow down your color scheme. This keeps the tree looking consistent and easier on the eyes. For our flocked tree, I wanted to keep things looking soft so I stuck with gold and silver. Simple ball ornaments (that come in a package) and ribbon are my go-to items. So so simple and easy. This year I used two sets of large ornaments and one set of smaller. I hang those first and then add the ribbon. This was the number one question I received. How do you get your ribbon to look like that? I will be doing an instastory video later today so look for that. I used three rolls of ribbon for this 7.5′ tree (25 yards). Unroll the ribbon from the carton and begin at the top. The idea is to create very graceful loops. It’s not as hard as it might seem. Create one large loop and then before you begin another one, pinch the wired ribbon together to form a crease. Creasing the ribbon in between sections of loops helps give them more body. They don’t need to be perfect or uniform. In fact it is better if they are not. Make your way around the tree and be patient. You can move branches to rest in between each loop, too. That gives it a really finished look. If you are using ribbon on your tree, considering using the same ribbon on a nearby wreath. 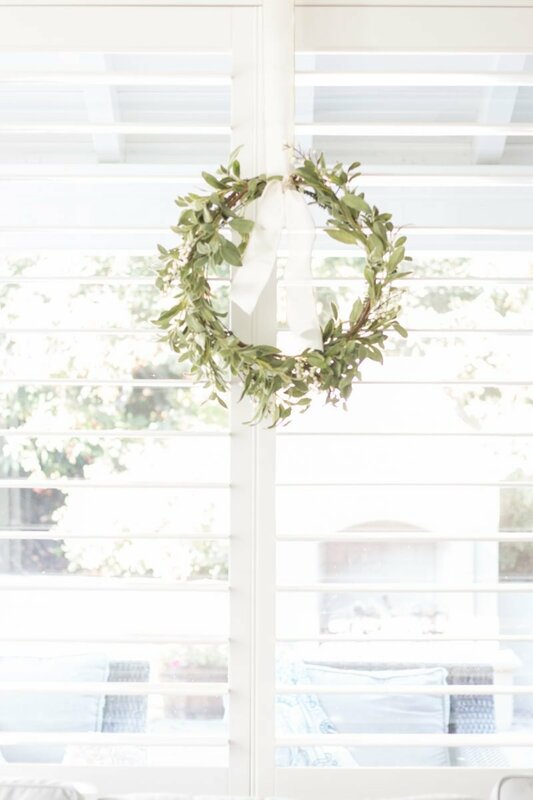 I will do a tutorial soon on how to make your own simple Christmas wreath. 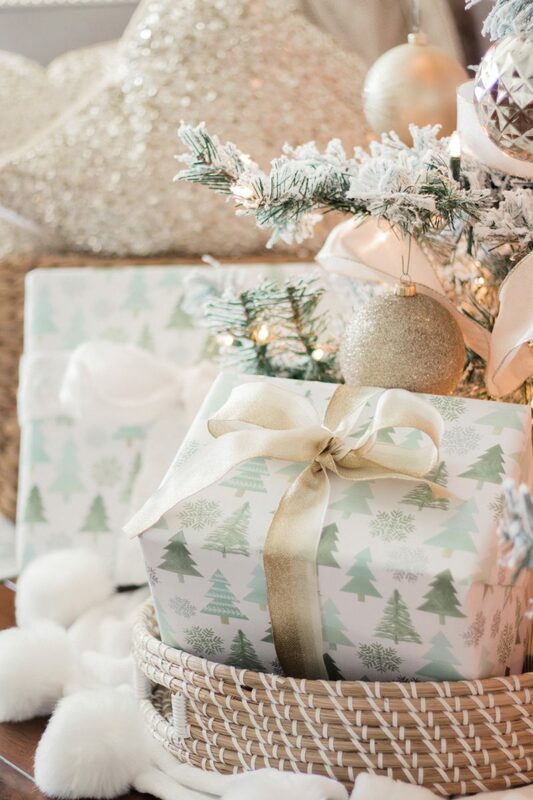 Under the tree is a perfect spot to make things look more beautiful. I took empty boxes that I had kept from deliveries and wrapped them up in coordinating papers. If you are more organized than me, you can wrap real gifts! LOL. 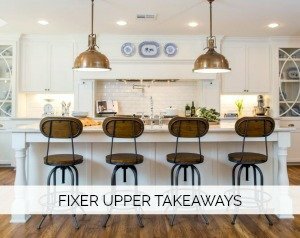 Shop the house for baskets and pillows that coordinate and add texture to the whole look. I borrowed the gold sparkly pillows from my daughter’s room. 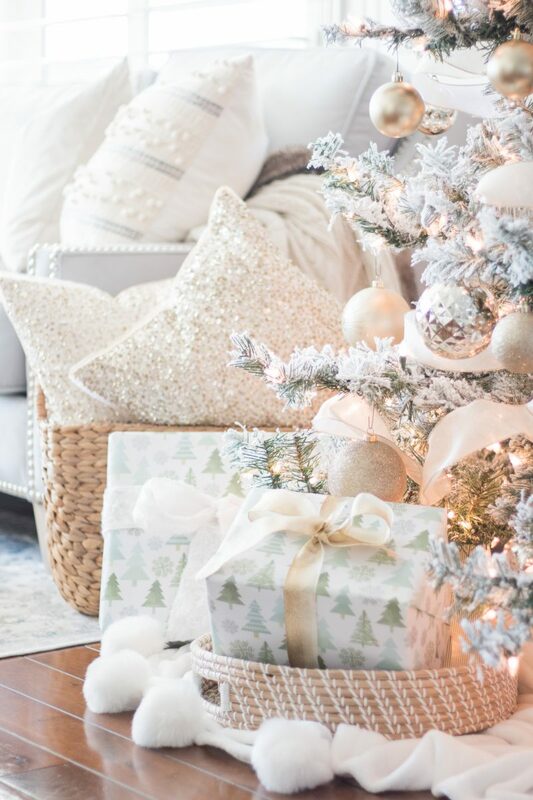 Considering using a throw in lieu of a tree skirt. First of all, they are far cheaper. Also, you can use the throw year round so it’s not another item to store away. I often find them for around $20 at HomeGoods this time of year. My particular tree has glitter. Yep, I know. Shudder. Unless you are Lydia from the Real Housewives of Orange County, glitter is pretty much the enemy. But it makes this tree so gorgeous because it diffuses the light. Having said that, when we took the tree out of the box I thought my husband was going to kill me. Disaster! Truly. I was second guessing my decision. It was either laugh or cry so I chose to laugh and grab a white sheet. I placed the tree on the sheet while opening it and fluffing it. Glitter was everywhere but then I just folded the sheet up in itself and tucked it under the tree. The white fluffy throw is over that. Then I vacuumed the floor and all was right with the world again. I purchased everything but the tree from Michaels. The tree can be found here. This is another gorgeous tree. The ribbon was on sale for 70% off so I get each roll for $3. The large tubes of ornaments were on sale for $10 each. I think I bought everything for this tree for under $50. 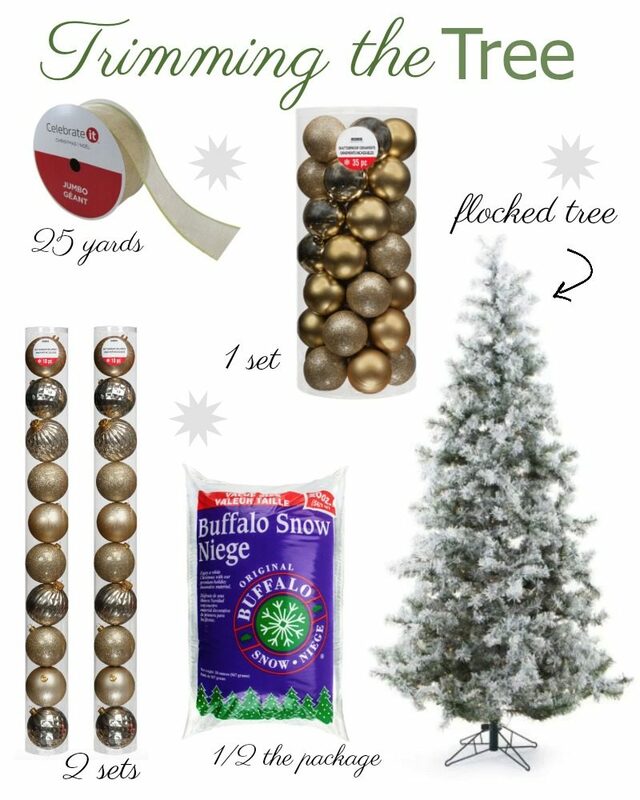 If you are using a flocked tree, a package of fake snow is your best friend. Take handfuls and stuff it into the middle of the tree. Not only does it add fulness, but it adds a dreamy quality while covering up the trunk and the empty spots. It only take 1/2 a package so you can keep the remaining for next year or share with a friend. Then you sit back and enjoy your tree! We do have a family tree in our front room that boasts all of our family ornaments. And for years that is the only tree we’ve had. It’s filled with creations made in school, photos of our little ones, ornaments from my childhood and those from our travels. I still do the same thing with the ribbon on that tree. This year my husband will set up his grandfather’s train beneath it. 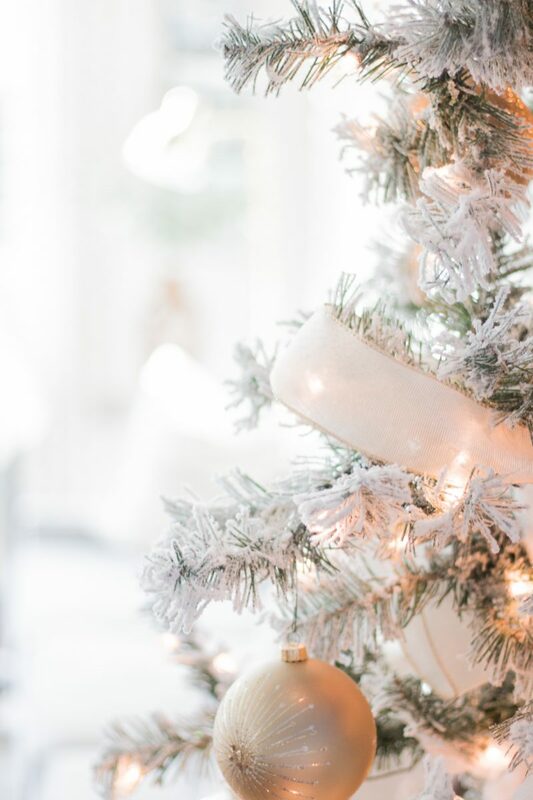 So while, it’s really fun for us to have a “fancy” tree, it’s the one filled with memories that really brings the Christmas spirit to our home. The children look forward to unwrapping and hanging their ornaments every year. So do we. I grew up doing that and love to carry on the tradition. (Sharing a glimpse of the family tree on Instastories right now). 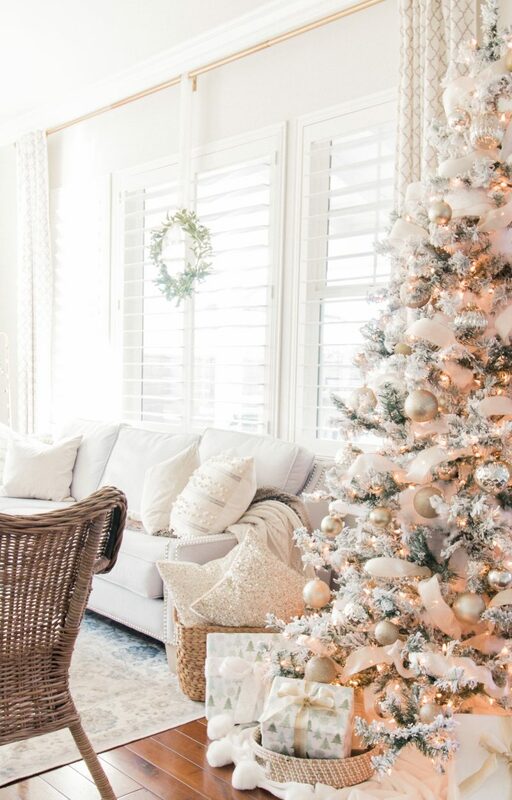 Whether you are trimming a three-foot tree or a grand 10 foot tree in your home, I hope these tips help. And of course you can’t do any of this without cranking up the Christmas music and making hot cocoa. Best part. For those of you with Pandora, check out Jack Johnson Christmas Radio. It’s so good! Courtney, your tree needs to be in a magazine! Actually on the cover of the magazine. It is so so beautiful and magical. A true winter wonderland. Funny about Lydia! We’re doing 2 trees this year. Our first year with two. I so look forward to unwrapping all of our special ornaments from our travels, childhood, ones given to us as gifts and those made by my nephews and nieces. Each has a story. You’re so sweet, Allison. Riley helped me decorate it and we had so much fun. Most of the time we were laughing at the mess. So fun to have the two trees this year. Enjoy! And we LOVE unwrapping all of those ornaments each year. Really is one of our favorite days of the year. Beautiful Courtney. And, I am glad you mentioned having another “family” tree. 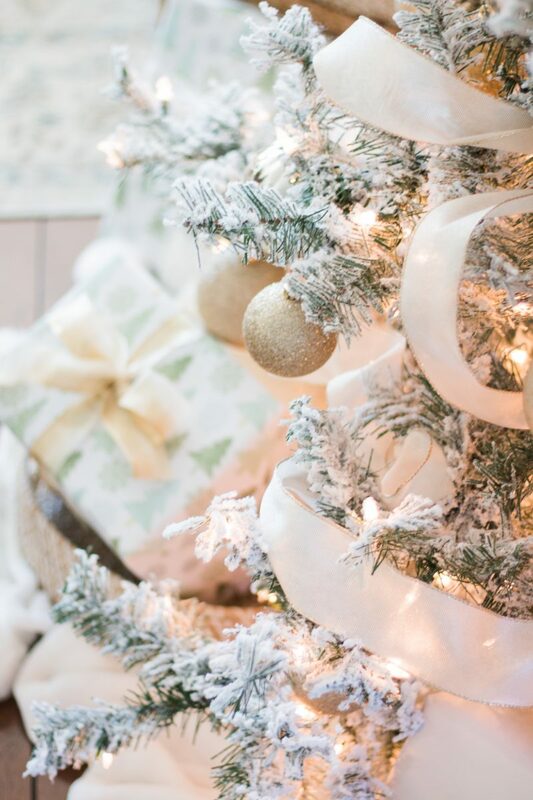 I see all of these gorgeous trees, and while they are just that…gorgeous, I always wonder where the collected ornaments are, the ones that hold memories. Now that our girls are grown, they love coming home to see ornaments collected over the years adorning our tree. It might not be magazine or blog worthy, but it means the world to us and them. That’s the best kind of tree. My favorite memories as a child are unpacking my special box of ornaments with my family. We would talk about them as we unpacked them and then we would beg my dad to string only red lights on the tree. We loved them for some reason. But I want my children to have those memories, too. 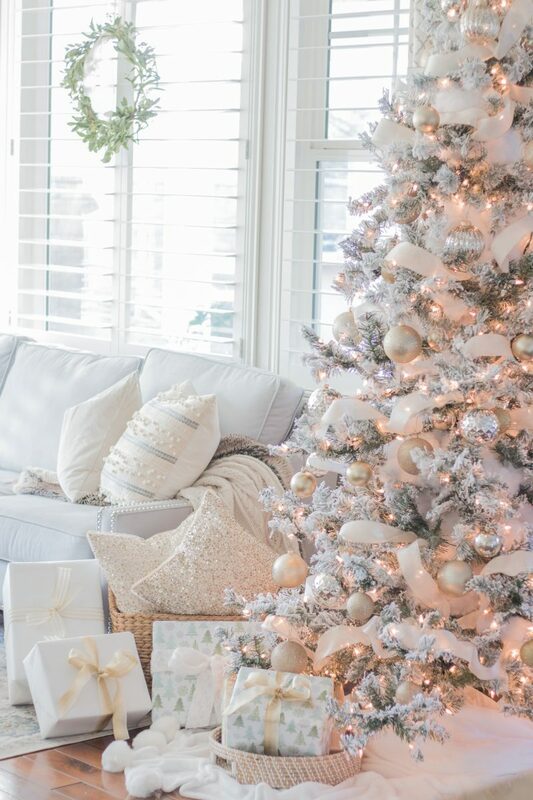 I also love the idea of handing a box of ornaments to the kids when they celebrate their first Christmas with a spouse. I remember my parents doing that and I love hanging them each year. Hugs to you, friend. Enjoy this special time of year. Your tree looks absolutely stunning!!! So many great tips!! Love your tips on adding ribbon- can’t wait to give it a try! Thank you! So happy it helped a bit. Let me know if you try it. Wired ribbon is key. Courtney, how beautiful your new tree is. I love it! It’s absolutely magical. Worth the glitter explosion, right?! I adore that tree. So dreamy and peaceful. I love how you explained how simple it was to create! I too put up a “fancy” tree which my daughter is now able to fully contribute to decorating (she’s 10) and a “family” tree full of all those special ornaments that bring back wonderful memories each year we pull them out. I like your idea of keeping it super simple and therefore enjoyable to put up/take down. I put up our fancy tree mid November as it’s in a room we don’t use as much yet has the window facing our street. I think it’s so lovely to catch a glimpse of a tree through someones window! As for glitter and flocking, anything like I remove from the box outside and bring it in afterwards. Great tip using the sheet! Love all of this!!! And it was so much fun having my daughter help with the “fancy” tree this year, too. In fact she was a help with all of the decorating which made it that much more special. I agree with you! A tree in the window is so inviting and pretty to see from the street. And why didn’t I think of that?! You are a genius. We TOTALLY should have taken it out of the box outside. Next year! Still using a sheet inside but removing it from the box outside. Thank you! Enjoy this season with your family. 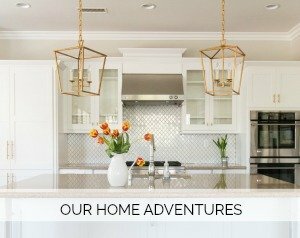 I recently started reading your blog – it’s so down to earth yet stylish and sophisticated at the same time! Love your aesthetic. And YES, that Jack Johnson holiday station really is awesome, THANK YOU for that suggestion!! PS – I made the sausage egg casserole (with Trader Joe’s chicken sausage) for post-Thanksgiving brunch and it was a hit!